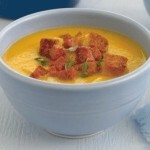 Place the canned pumpkin puree, along with 3 cups of the broth in large kettle. In a small frying pan, heat the butter or margarine. Then add the ginger and onion and saute until the onions are soft. Add the onion the mixture, habanero, and the spices, to the pumpkin puree. Simmer the bisque for 15 minutes. Strain it, then returnit to the stove and heat through. Remove from the heat and stir in the orange juice, zest, and rum. Garnish with croutons and sage leaves and serve.